URGENT: Grand totals are WRONG! I'm very new to Tableau and need to prepare some reports. I don't know if I can explain what I'm doing, so I've attached the workbook. In all sheets, grand total of column is wrong. (It's the same number of 3rd row). Why is this wrong? How do I fix it? 1. Re: URGENT: Grand totals are WRONG! 2. Re: URGENT: Grand totals are WRONG! EDIT: Thanks for the link. Fixed the post. 3. Re: URGENT: Grand totals are WRONG! Thanks for posting a packaged workbook. The reason why the Grand Totals are coming out as they are is that Grand Totals are computed as the measure at a higher level of aggregation. In the worksheet you posted, every return_order has a LensKart value, so the COUNTD(return_order) returns 1872 for LensKart and does the same in the Grand Total. You just said the "grand total of column is wrong", you didn't specify exactly how you wanted the grand total aggregated. See http://community.tableau.com/docs/DOC-5069/ for more information on grand totals and some links to different solutions. 4. Re: URGENT: Grand totals are WRONG! I'm sorry for being so vague. But I simply wanted the sums of all rows and columns. So you're saying Tableau will show the maximum of the values as grand totals? How do I set it to compute actual grand totals of rows and columns? 5. Re: Re: URGENT: Grand totals are WRONG! What you say are "actual grand totals" is a specific sort of secondary computation, namely an aggregation (a sum) of your aggregate calculation (countd). That's not how Tableau currently works. What Tableau does is use the original aggregate (countd) at a higher level. If you SUM is your original aggregate, then Tableau sums across the column/row. If it's MIN or MAX, then Tableau computes the MIN or MAX across the column or row. For COUNTD, Tableau is computing COUNTD() across the entire column or row. 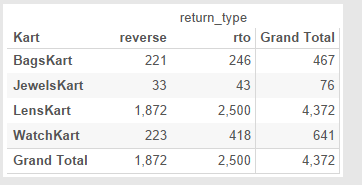 A quick way to make Tableau do that is to use the 2nd technique from http://drawingwithnumbers.artisart.org/customizing-grand-totals-part-2/, using duplicates of both Kart and return_type on the level of detail. I set this up in the attached. 6. Re: Re: Re: URGENT: Grand totals are WRONG! EDIT: I checked with the data team. They are telling me that the grand total is correct, but the row for "LensKart" is the same as grand total, which obviously is wrong. 7. Re: Re: Re: URGENT: Grand totals are WRONG! 8. Re: Re: Re: URGENT: Grand totals are WRONG! I cannot find Compute Using anywhere! 9. Re: URGENT: Grand totals are WRONG! 10. Re: URGENT: Grand totals are WRONG! Right click on the table calculation's pill and choose Edit table calculation… For a set of tutorials on table calculations, see http://drawingwithnumbers.artisart.org/want-to-learn-table-calculations/. 11. Re: URGENT: Grand totals are WRONG! Hi What if I have a Manufacturer in the Columns as well I get the result only for 1st Manufacturer whereas my other Manufacturer columns reflect blank. 12. Re: URGENT: Grand totals are WRONG! Did you exclude any values? I had similar problem calculating the difference between periods and grand total wasn't working as i wanted. Rather than excluded i filtered and it worked out.